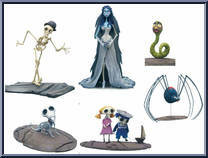 Includes Corpse Bride, Black Widow & Maggot, Skeleton Boy & Girl, Scraps and Skeleton Man. Contribute pictures, update details or suggest corrections for Corpse Bride Box Set. Write a review about Corpse Bride Box Set.